What’s the Strategic in Strategic Thinking and Planning? Why bother learning how to think, decide, prioritize and plan more strategically? Most of us are “getting through” life and work reasonably using our current thinking skills and abilities, experience and knowledge. Why bother with continuing to learn and practice the specifics of strategic thinking and planning? 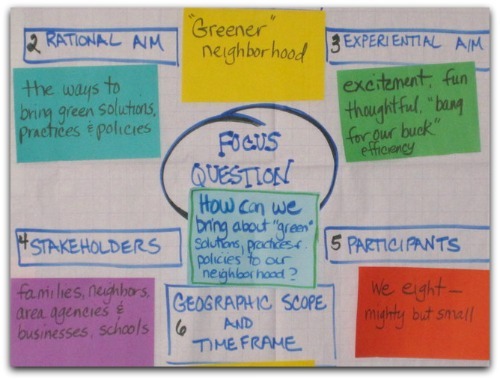 In this blog, I offer some of my material from a strategic thinking course that I have developed for government leaders as well as material from our learning modules and the key strategic planning model that I use. We’ve chosen to speak about both because strategic thinking is the foundation for strategic planning. What’s the difference between the two, you ask? Strategic thinking is a skill set that can be applied to any complex problem solving process. It is a skill that can be used on a daily basis, on your own or in groups. 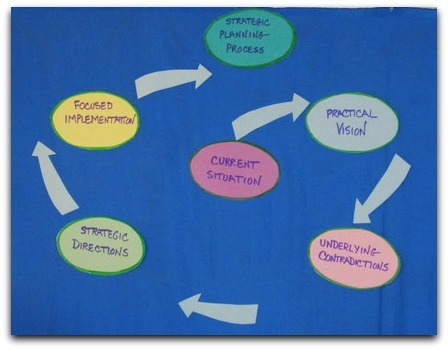 Strategic planning is an application of strategic thinking that involves teams, organizations or communities. 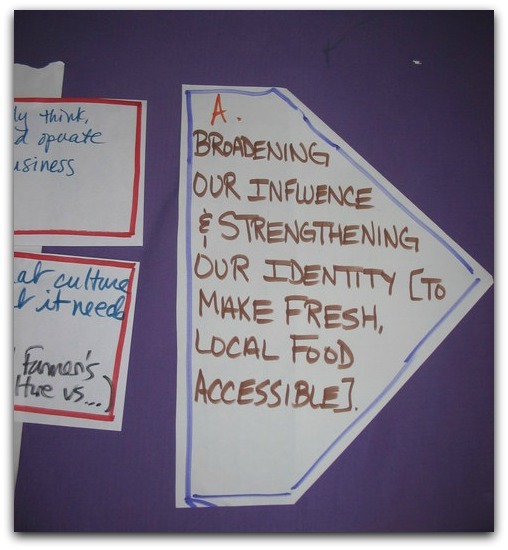 It is typically conducted every 3-5 years to help groups grow and continually evolve to address changing needs. 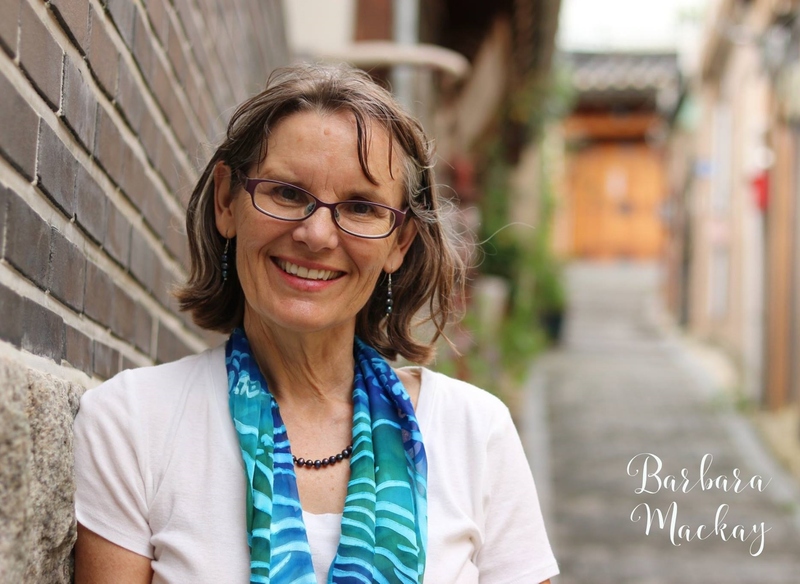 I hope that our sharing today inspires you to be intentional around developing this skill of strategy making as well as carefully choosing the strategic planning model that will best suit your needs. We offer some great resources at the end of this article. Why do we need to be strategic? Strategic thinking is a combination of many modes of thinking, including analytical, creative, visionary, contradictional, tactical, gut-feeling (intuitive), chronological, holistic, and critical among others. When do you use Strategic Thinking? 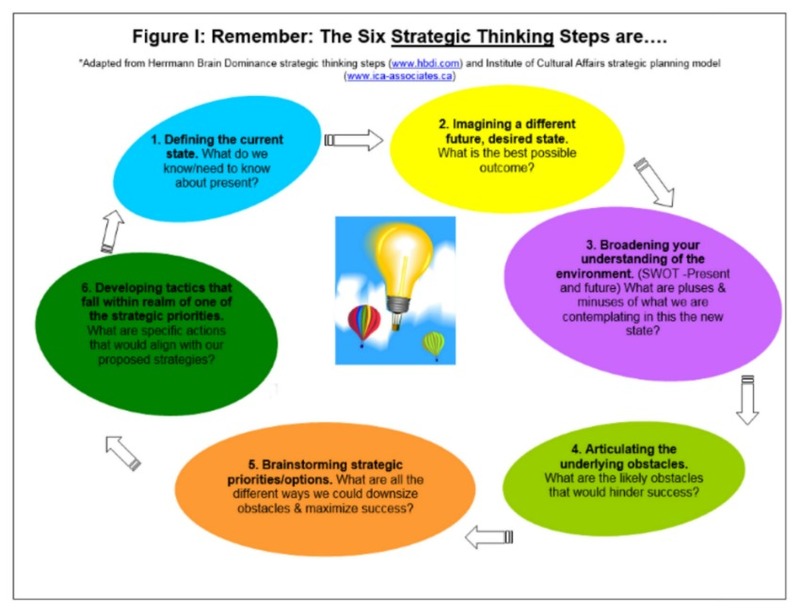 What are the steps to strategic thinking? 1. Defining the current state. Tips: You are scanning the internal and external environment for everything you know about the situation. You are objectively describing what exists now – both good and bad as though you were an outside neutral observer. 2. Imagining a different future desired state. Tips: You need to be relaxed to be able to think positively about a current bad situation. Suspend judgement and disbelief. 3. Broadening your understanding of the environment. Tips: You are being honest and realistic about your current resources and abilities to rectify or change a situation. You are also being thoughtful around future opportunities and threats. 4. Articulating the underlying obstacles. Tips: Aim for both “tried and true” and “bold and new” ideas and actions. Borrow or beg “shamelessly” from other people’s “good” ideas or projects elsewhere. 6. Developing tactics that fall within realm of one of the strategic priorities. Based on our thinking on strategic thinking above, we would urge you to also consider that strategic is about ensuring you and the group really dig deeply to look at what gets in the way of implementing your vision. This means looking at root causes or in the Technology of Participation (ToP) model of strategic planning, we call this contradictions to the vision. This is a unique piece in the ToP method that we have found to be extremely valuable to organizations and groups. When do you do strategic planning? Structural Changes. Your organization has recently acquired, been acquired or merged with other departments or organizations. When this happens you need to bring together different cultures, address mistrust and often adjust your mission statement. Or, you have had a lot of changes in personnel – new leaders, key staff are coming on board. Economic Changes. Your organization has recently had a significant increase or decrease in funding. You may need to make some hard choices about priorities because you either have fewer resources to do the work of the organization or you seem to have lost your mission focus. Policy Changes. Your board or senior leadership teams have decided to address a social or health issue you haven’t focused on before. Or, you are focusing on a new target group, product or service. You need to know how these changes affect the overall mission and values of the organization and move carefully to implement them. What are the steps to strategic planning? Strategic planning models very a lot. They usually all have vision, goals, objectives and action plans. We would say this is not enough to make a plan strategic. To be strategic, you must also look at strategic issues or obstacles to the vision. Then, you can systematically devise ways to overcome the root issues and move you closer to the vision with strategic actions. You should also end up with three to four core foci (strategic goals or directions) that help you make decisions about what to put your energy into in the future. The photo on the right is an example of a well worded strategic goal or direction. Every important or high impact decision that comes up after a planning process should be screened. Those decisions must support or help move forward one of more of your strategic goals or directions. Most people experience some fear and/or frustration with strategic planning largely because it is not done in an inclusive way or it fails to address the root issues that the organization is facing. You want to use a process that gives you a deeper appreciation and understanding of exactly what is needed, at this moment in time. It feels truly magical when you have good processes to do this. 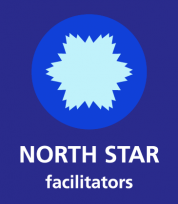 When you include all the critical steps, incorporate sound processes for strategic planning and have an experienced facilitator guiding you, you will find yourself falling in love with strategic thinking and planning. See also www.ica-usa.org or www.ica-assciates.ca for training dates around the globe.